The Bishop: They came only to see, from the east and from the west, from the city and from the plain. They came not, in holy reverence to the lord, but in lust. Q: What are the differences between the theatrical version and so-called Director's Cut of the movie? While going to the town of Ashby Wake, the drifter Cassie (Christina Ricci) is hit by a car driven by Marion Kirkman (Kerry Fox) and loses her memory. Marion invites Cassie to stay in her huge old house with her family, while recovering from the trauma. Cassie becomes very close to Michael, the young son of Marion's husband Simon Kirkman (Stephen Dallane). He is researching a recently discovered buried church from the First Century, with images of the crucifixion of Jesus and many anonymous persons watching it. Cassie starts having visions and premonitions with some locals, and decides to investigate the weird and nasty mechanic Frederick Michael Argyle (Peter McNamara). Her findings about who she is and the mystery relative to the locals and the town surprises her. 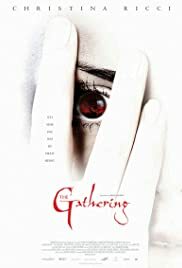 "The Gathering" is a good, original and mysterious horror movie, in the same line of "The Others", "Haunted", "The Sixth Sense"and "El Espinazo del Diablo". It is not gore, but very creepy and scary. Christina Ricci is magnificent, as usual, and the idea is fresh and unusual. The conclusion of the story is commercial, but it is not bad. My vote is seven.